There is a one-time set-up fee of $2,499 for each website. Infinite scrolling, “save your fave”, power search, dynamic vehicle highlights, and advanced vehicle comparison allow shoppers to quickly hone in on the vehicle that’s right for them. Lightning-fast load times with advanced comparison and dynamic vehicle highlights make it fast and easy for shoppers to understand the unique qualities of each vehicle in your inventory. All relevant specials and incentives are automatically displayed on VDPs, and are organized to show consumers Best Combined, Lowest Payment, and Lowest Rate incentive combinations. Automatically identifies and focuses on the unique highlights, features, and equipment of each vehicle in your inventory. These highlights display prominently on both SRPs and VDPs. Free text search function with voice-command integration allows shoppers to find 100% of all inventory features, functions, and descriptions. Automatically corrects for misspellings and provides suggestions based on actual inventory. When will my new website go live? Every effort is made to go live within 30-60 days. Why do I need a responsive dealer website? 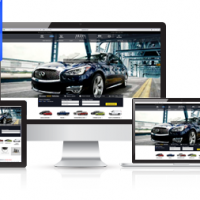 How can I update my dealership website? Contact our dedicated support team and they will be happy to guide you to the best option. JAZEL is committed to your success! We are an integrated team of creative technologists offering a full-range of digital marketing capabilities that deliver powerful results.